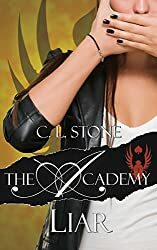 Liar is book two of the Scarab Beetle Series set in the Academy world written by CL Stone. PS: If you haven’t read book one, Thief, go back and do that now. Don’t read this review. Might be spoilers. Kayli tried to leave. She went back to the hotel to find her brother and her father. She tried to get away from the Academy boys to clear her head. But Will is missing, and the Academy might be the only ones that can find him. After a series of suspicious conversations, Kayli is convinced that she needs to find out more about the Academy before she can let them find Wil. Who are these mysterious, but very hott, boys that keep saving her life? And trying to do good in bad situations? Kayli’s feelings get more intense, and she can’t reconcile the evil Academy that Blake shows her with the kind hearted and protective boys she’s come to know in Axel, Raven, Marc, Brandon, and Corey. And now, on their mission to Florida, there’s a little girl’s wellbeing at stake. Trusting the boys, and Blake, may be the only way to save her. But can Kayli really trust that much?